Despite tighter budgets driven by the fragile economy, IT departments remain under intense pressure to deliver additional and higher-performance computing, network and application services worldwide. To achieve their "do more with less" goals, they need to transform their data centers using a combination of consolidation, virtualization, and automation. Once these initiatives are properly established, IT can extend the virtual edge of the data center to branch offices where high-performance services are delivered locally from centrally managed infrastructure. 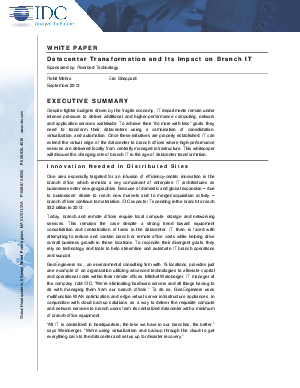 This whitepaper will discuss the changing role of branch IT in the age of data center transformation.